Paul Tiernan, once singer with "Flex and the Fastweather" a band who in their heyday had a string of hit singles in Ireland, a publishing contract with Paul McGuiness of U2 and a top ten hit in Sweden, has for the past few years embarked on a solo career culminating in the release of his debut album titled" Who's fooling who?" in 1995 in Ireland. His first release has since then notched up healthy sales and great reviews as well as distribution by companies in Ireland, Germany, Switzerland and Norway. as Katell Keineg and Sinead Lohan's guitarist. Paul has also written several songs for acclaimed Irish artist "L" . of melody crossing over the rock- traditional divide. This distinctive combination has so far resulted in a successful tour of America and Scandinavia in 1994, a management contract with KPM America ( who also manage Don Was, producer of the Rolling Stones, Bonnie Raitt, B52's), a stunning performance at the international South by Southwest seminar in Texas in 1995, tours of Switzerland and of Germany in 1996 ,1997 ,1998 and 1999, a publishing contract with PeerMusic and a string of vibrant performances to wildly enthusiastic crowds all over Ireland. 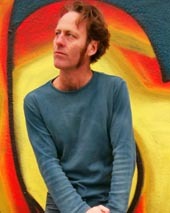 With his second album 'Virgoville", produced by Kieran Kennedy (of the Black Velvet Band) released last year in Ireland and still receiving great press (see reviews), Paul Tiernan took a radical departure from his acoustic string driven sound into the land of sweeping electric guitar landscapes with his collection of powerful new songs.